Recycled glass vases provide lots of new decorative options for your home! I don’t know about you but I have gotten quite a collection of glass vases. They are all the courtesy of my wonderful husband who frequently brings me beautiful flowers. 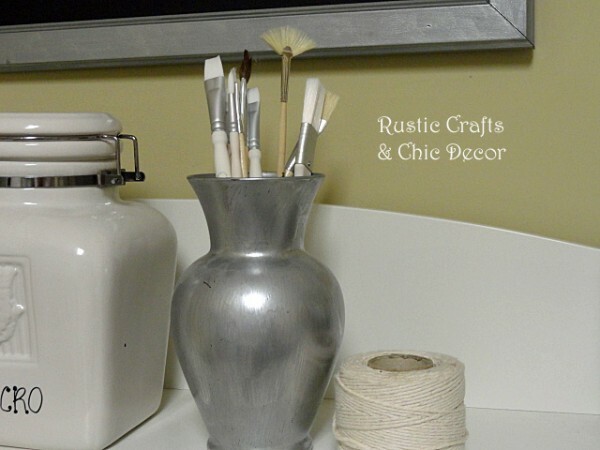 If you have vases to spare, I’ll show you how to recycle glass vases to use decoratively or for storage. I have tried several different techniques, on my old vases, to give each one its own personality. They are now occupying a variety of different spaces within my home and it doesn’t look like the same vase everywhere. Here are a few ideas of how I recycle glass vases to give them new life. Paint is a great way to give a vase a more solid look. For this vase, I simply painted the vase with a metallic paint and then when the paint was dry I sanded spots off to make it look weathered and old. You can fill the vase with fresh or faux flowers. 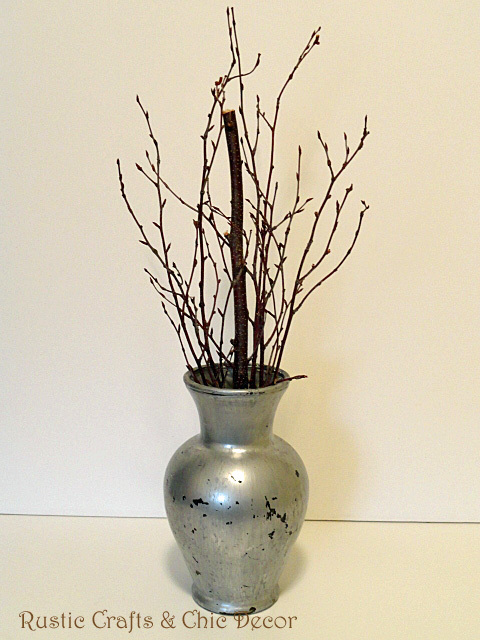 I filled my vase with birch branches that have been sprayed with polyurethane for a more rustic look. It looks totally different then when it was clear glass and used for fresh flowers. You could go a step further by tying raffia or a bow around the neck of the vase for added appeal. Try any color or finish to go with your decor style. 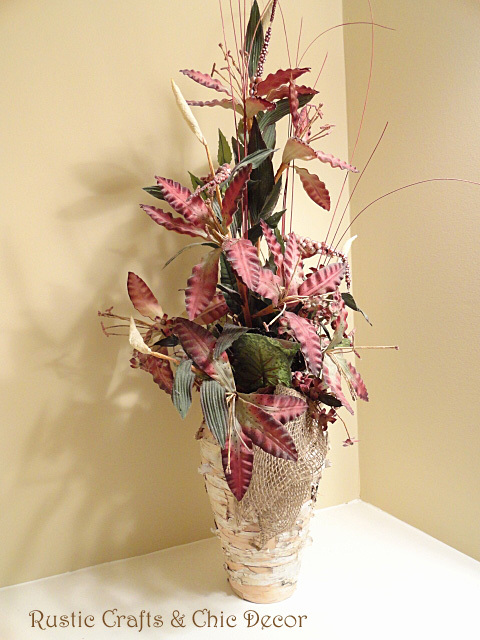 Another idea is to spray the vase with a textured stone look paint. Now you end up having a vase that looks very substantial, just like stone, and yet not too heavy. There are so many different varieties of stone color and texture spray paints available for several design options. 2. This is my favorite recycled glass vase idea. 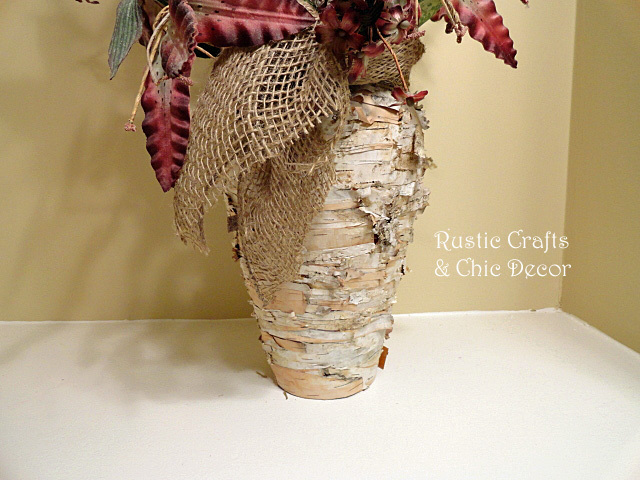 I wrap the entire vase in birch bark for a very rustic look. If you don’t have your own birch logs to peel, you can purchase birch bark already cleaned and ready to go. If you have your own birch logs to peel,it usually peels fairly easy. Once you have several strips, start applying the birch to the vase using hot glue. Keep winding all the way up until the entire vase is covered in birch. Let the loose curly ends hang for it to look natural. 3. Besides decorative use, you can also recycled glass vases for storage. I have used them in my craft room and they have come in quite handy. I painted mine but you could also leave them clear for storage to provide more visibility. If you have recycled glass vases in your home, I would love to hear what you did!